What comes to mind when you hear the word mahogany? Elegance? Class? Style? Mahogany is a straight grained, reddish brown wood harvested from three tropical hardwood species indigenous to the Americas. The Honduran, or big leaf mahogany, has a range from Mexico to the southern Amazon in Brazil, and is the only true mahogany species used in commercial applications today. Illegal logging of this commodity led to it being placed on the Convention on International Trade in Endangered Species list in 2003, the first time a high value tree was listed. West Indian or Cuban mahogany is native to southern Florida and the Caribbean, currently being used for commercial applications. Swietenia Humillis is a small, often twisted mahogany tree found in dry forests in the Pacific Central America, and has limited commercial use. The features of each of these species include a wonderful, clear, find grain, and will provide minimal shrinkage and swelling in different types of climates and temperatures. Classic mahoganies like these will always make a good investment no matter what their intended use will be. But like every classic material, there are options available that imitate the look and feel of real mahogany. African mahogany is a little bit different. It carries many of the same characteristics as its Caribbean counterpart, and looks identical in many ways, yet isn’t considered to be a true mahogany. Processing is a little more difficult, meaning care must be used to create a smooth finish without snagging the wood. Asia has also entered into the mahogany market. While their mahogany is close in appearance, it is worlds apart when it comes to the workability of the wood. They are a good option for plywood, and work well as engineered flooring, but won’t match true mahogany’s quality when it comes to traditional flooring and furniture production because of its limited durability and its tendency to splinter. When you’re out looking for flooring, and you’ve narrowed your focus to mahogany, what should you look for? True mahogany – the Honduran or big leaf mahogany – has been restricted for years because of its over-harvesting, and there are few ways to obtain it on the open market, outside of recycling it from an older home. 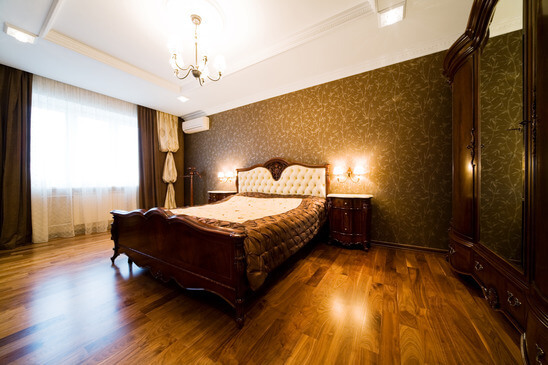 The best options for getting the look and feel of real mahogany is to choose plank flooring with well processed African mahogany, or choose engineered mahogany options using high quality African, Caribbean or Asian mahoganies. In most cases these are expertly processed so they will look and feel as good as the original. Have additional questions? Stop by today and see the many options available to you on our showroom floor.